Claudia Vásquez Gómez performing “I Miss You” in the Chiricahua Mountains, Arizona, 27 October 2016. In 2016, Claudia Vásquez Gómez, an artist from Chile, was especially struck by the way border police attached tires to the backs of their vehicles, dragging them across the desert. The smoothed earth then captured the footprints of anyone passing through the place. Responding in performance and video, Vásquez tied a rope around her waist, dragging a tire across various landscapes as she walked them. It was a way to both “tell the story and erase the story at the same time,” says Chris Taylor, director of Land Arts of the American West, a program of Texas Tech’s College of Architecture. 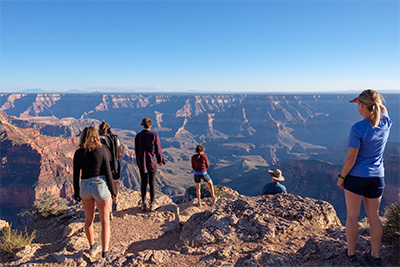 Arrival at Point Sublime on the north rim of Grand Canyon National Park, Arizona, 26 September 2018. Each year, Taylor takes a group of artists, architects, and writers on a 10-week trip across the West. They spend time at sites like Spiral Jetty, Lightning Field, Double Negative—interventions in the landscape by artists in the 1960s and 1970s—and at sites that bear traces of human intervention from many hundreds of years ago. They visit scientific research sites, structured wilderness sites, and art sites. As they travel, they participate in seminars and conversations led by Taylor and visiting scholars, artists, writers, and interpreters of the land. “We’re looking at a range of sites and filtering that, relative to our work,” Taylor says. 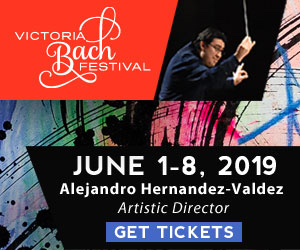 The program began at the University of New Mexico in 2000 and Taylor, then a faculty member at UT-Austin, came onboard in 2001, growing it into a collaboration between the two universities. In 2008, Taylor moved to Lubbock and the program branched into two. This is the 10th field season Taylor has led from Texas Tech. 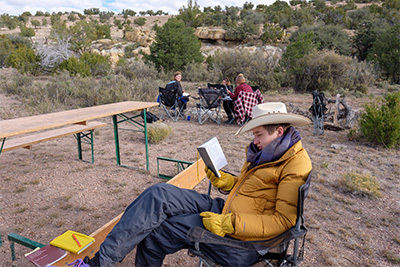 Hannah Rotwein reading after breakfast, Point of Rocks Canyon, New Mexico, 20 October 2018. “As an architect, I define land art very broadly,” Taylor says, noting the distinction between his approach and that of art historians, for example. “What we’re looking at is what people have done in the land over time… Given the complex challenges we face as a species, we need a more complex understanding of land.” The program brings artists together to formulate more expanded understandings of the changing landscapes around us. Given the renewed visibility of debates around the border, I ask if the program has changed with the winds of American politics. “The border has always been present for us, has always had visibility,” he says. He describes border patrol agents visiting the group’s campsites in confusion. This is the “motivation for investing in the humanities,” he says, “we can’t generalize. We need to deal with the tangible realities of these places.” There is, he suggests, nothing black and white about human relationships to our shifting landscapes. 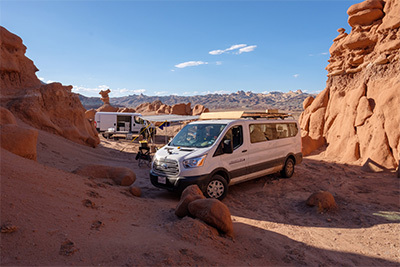 Camp kitchen with vans as attempted wind break, Goblin Valley, Utah, 11 September 2018. The program continues to run close to the ground, financially, and Taylor looks forward to a future in which it is fully funded and open to a wider community of participants. 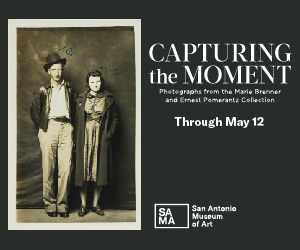 He also looks forward to making the resulting image archive available to researchers: every year, the program generates close to 20,000 images, creating an important visual history of the landscape of the American West. By design, the trip adapts to unplanned experiences. This year, the group hoped to spend several nights at Goblin Valley in central Utah. “It seemed like a great spot,” Taylor says, laughing. “But there was this rather exceptional wind, funneling right through where we set up the kitchen.” The whole group clambered into the back of the cargo van, bandannas covering their faces. “It’s this beautiful, amazing place,” Taylor says, “but I am just losing my mind. There is sand everywhere.” So, they packed up early and headed to the next site. 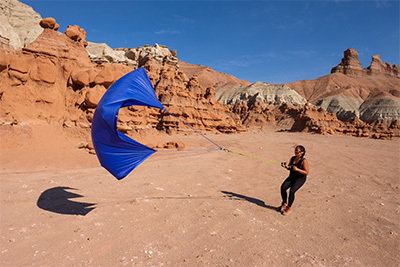 Cara Joven working with the wind, Goblin Valley, Utah, 12 September 2018. That longer, slower time frame is one of the lessons of land, and for Taylor, it is a space for hopefulness. “Examples of time are usually shown in a negative light (thinking about plastics, or climate change, or an ecological time bomb). But we are planting these things. There is the time of our individual lives, our time together, geological time, a planetary imaginary.” The significance of the program is, he says, how it grapples with questions of interaction, immersion, and weather, over time. That is to say, perhaps what Land Arts teaches, is how to face the weather, as it moves us.